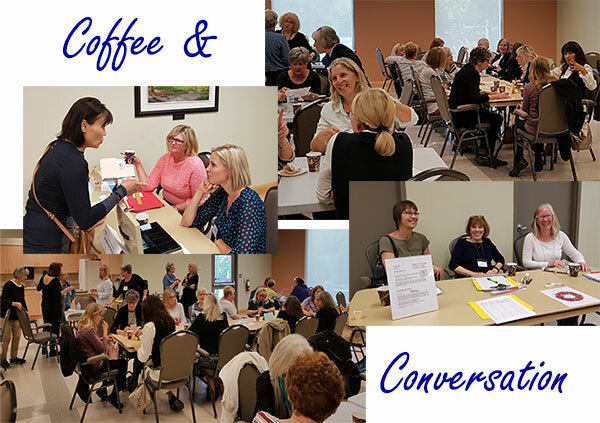 Past Events | Niagara-On-The-Lake Newcomers Club | Welcoming Women Of All Ages To Our Beautiful Town. Niagara College gave us a very warm reception and a great tour of their Niagara-on-the-Lake Campus. Thirty Newcomers spent an hour with Tom, a Human Resources Student who enthusiastically shared his knowledge of the campus and college courses. We visited the new Innovation Centre, Greenhouse, Restaurant, Brewery, Winery, and the Spa. Did you know there is a spa open to the public? Great rates allow students to practice their new skills doing pedicures, manicures etc. Check the spa website for more info. We also saw the Culinary class facilities - wow what great kitchens! Check out their weekend classes. Next up was the restaurant managed by the Hospitality program. On to the green houses which were amazing - especially on such a sunny day! And continuing the tour we stopped at the Brewery shop and the Wine tasting bar and info centre. The tour impressed upon us how all these programs work together. The Restaurant (open to the public) is managed by the hospitality program, the food is prepared by culinary students, the wine and beer selections are provided by the vintner and brewery programs, the herbs and vegetables were grown the green houses. And wait - the apiary program with its 35 bee hives - provides the honey for the food too! Many members are sure to return to purchase plants, visit the spa, enjoy the restaurant, and then take home wine and beer from the shops. Niagara College Representative Lauren, arranged for refreshments supplied by the college Culinary Program, which were followed by a Bruce Trail Club presentation from Margaret Northfield. Everyone is welcome to join one or two club hikes before becoming a member. You are also free to hike the Bruce Trail on your own. Learn more about the Bruce Trail Hiking Club. Remember our next outing is the Neob Lavender Farm on April 17 at 1:30 pm. Sign up for tickets for this event. 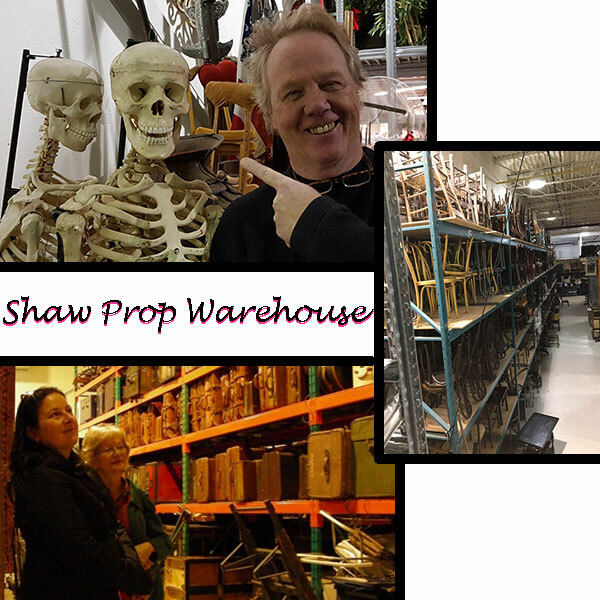 Twenty-three Newcomers gathered at the Shaw Costumes and Props Warehouse in St Davids to receive an exclusive tour with Don Finlayson, Director of Production. The Shaw Theatre garnered this space approximately 10 years ago so they could amalgamate all their storage space into one unit. After moving 26 tractor trailer loads of 'stuff' they were done! The warehouse staff, like any homeowner with a garage or basement, constantly need to wage the battle between what to keep and what to toss. Recycling is a regular practice here, with mens' pants being the easiest to reuse. 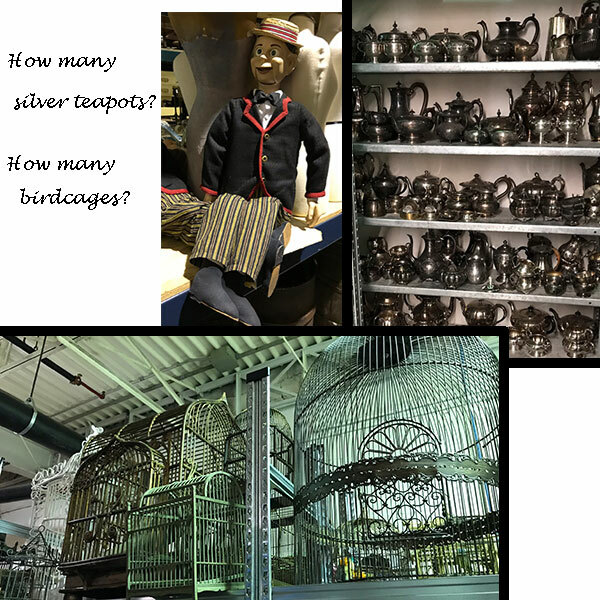 We walked freely between rows and rows of costumes, furs, shoes and hats from the Shaw Era, in many different colors and sizes. The prop warehouse was endless and included 2 (fake) skeletons, a wide array of luggage, antique typewriters, fake flowers, baskets, wine and Coke bottles. A tip passed on to us by Don; when the designers get the right shoes on to the actors, everything else will fall into place. Hours rehearsing and performing on their feet mean that the footware is the first thing any actor notices after that, they are willing to wear any type of costume you toss their way. 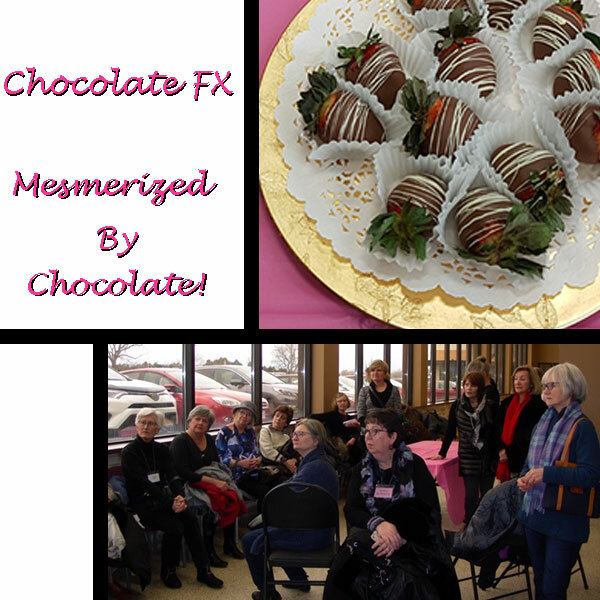 Following our warehouse tour we moved to the retail site of Chocolate FX where they gave us an informative tour. Who knew that it takes 20 pounds of cocoa pods to make 1 pound of cocoa paste? Cocoa beans are about the size of almonds and are fermented underground for 3-5 days, after which they are rinsed and dried for a couple of months. The bean is then ground to make cocoa butter for white chocolate as well as cocoa powder, to make chocolate. Chocolate FX (Chocolate Effects) processes 14,000 pounds of chocolate per week and sells 80% of their products wholesale. They are also currently looking for more employees; not a bad place to get a part time job! Did you know that chocolate is a fruit...and of course we all need to eat our fruit quotient everyday! BTW they can coat just about anything in chocolate but if you are interested in chocolate covered bacon or crickets... they can't help you. We were treated to some lovely luscious chocolate dipped strawberries as well as a take home chocolate lollipop. Yum! Thank you to Debbie, Debbie and Wilma for a lovely informative tour. Thank you to all the Newcomers who joined us, a good time was had by all. The Presentation was done by the Shawna Butts, Assistant Curator of the Museum. The topic was a look at women of Niagara-on-the-Lake who made an impact on our town history. Shawna is currently working with a team at the Museum on a publication coming out this October on this subject so we we’ll look forward to that! Originally the presentation was going to focus on Maria Rye and the thousands of home children that came through Niagara-on-the-Lake in the 1800s and 1900s. But the speaker was called away and Shawna graciously stepped in. She did include Maria Rye and the Western Home but we were shown there were many other women in our town’s history to be recognized as well. There is so much history here! The first woman in our presentation was Chole Cooley. This was of interest to me because I live just around the corner from Cooley Lane. And I’ve seen the plaque on the Niagara Parkway with her name. Chole was a slave in 1793 living in Canada who was forcibly dragged and carried across the river to be sold in the US. The heart-breaking image of a woman torn from her home and family to be sold made such an impression on the local residents that when the story reached Lord Simcoe he initiated the legislation in Upper Canada that was the beginning of our anti-slave laws. It wasn’t easy because slavery was allowed in the British colonies and many grand families owned slaves, but it was the first step in the abolition of slavery. We don’t know what happened to Chole in the United States but her legacy had a lasting impact on Canada. And history shows the important role Niagara played on the Underground Railway which eventually led to the freedom of 30,000 slaves who escaped to Canada from the US. Of course the War of 1812 produced all sorts of local heroes, including Brock and Macdonell. And we’ve heard of Laura Secord. But did you know about her sister Hanna? Of course not… She ran the mill in St. David’s and stood up the Americans when they retreated and burned every building on their way back across the river in 1814. They didn’t burn the mill – she saw to that. It was January and everyone had one hour notice to get out before they set fire to the villages in the peninsula. The men were off fighting so the women and children were left behind with no shelter or food. Many lives were lost that winter so all the women who survived with their children were heroes! And women were always left behind. At the time of the War of 1812 there were almost 40 women and 60 children living in Fort George, the families of the soldiers. They were responsible for all the cleaning, cooking and washing for the troops (not just their husbands) in the fort. So it was terrible times when everything was burnt down that January. Many had to walk back to York (Toronto) to survive. Maria Rye and the British children were included in the presentation. Maria came to Niagara in the 1868 and set up the Our Western Home for orphans who were being shipped to Canada and other colonies in that period. Previously in England she was an advocate for girls and women’s education. The home here in Niagara-on-the-Lake was almost exclusively for girls and if they were not adopted they were trained to be house servants. By the time the house closed in 1915 an estimated 4,000 girls came through Maria Rye’s home. Unfortunately the records are unreliable and it’s near impossible to trace the history of the girls or where they ended up. The last women included in our presentation was Elizabeth Ascher who lived from 1869 to 1941 in NOTL. She was a true “Renaissance Woman” who supported the IODE, Agriculture Society, Boy Scouts, Red Cross and many more organizations. But her passion was working with the many Polish soldiers who came to Niagara to train to fight in WW1. She nursed many through the Spanish Influenza outbreak in 1918 with no thought to her own health. She continued after the War to raise money for the rebuilding of Poland and was the only woman to receive one of the highest honours awarded by the Polish government. Every year NOTL in reminded of the Polish connection with a ceremony for Elizabeth and the Polish soldiers buried here in town. Our presentation finished with a reminder that the Museum will be providing a monthly lecture series, this year focusing on Fashion and Art in NOTL’s history. In addition they provide fascinating walking tours through NOTL in the summer and of course the cemetery tours in September. Other coming events include the Snow Birds Aerobatic Flight show this September which should be a very successful fundraiser for the expansion of the Museum. Consider joining the Historical Society and Museum. 100 Newcomers gathered together in the wonderful banquet hall at White Oaks Resort and Conference Centre on December 5 for our annual luncheon. The buffet had a nice selection and everyone especially honed in on the desserts! We found the servers did an excellent job and the room was filled with positivity, even more so after the door prizes and centrepieces were distributed amongst the crowd. Events like these are great opportunities to meet other Newcomers outside of your Interest Groups. 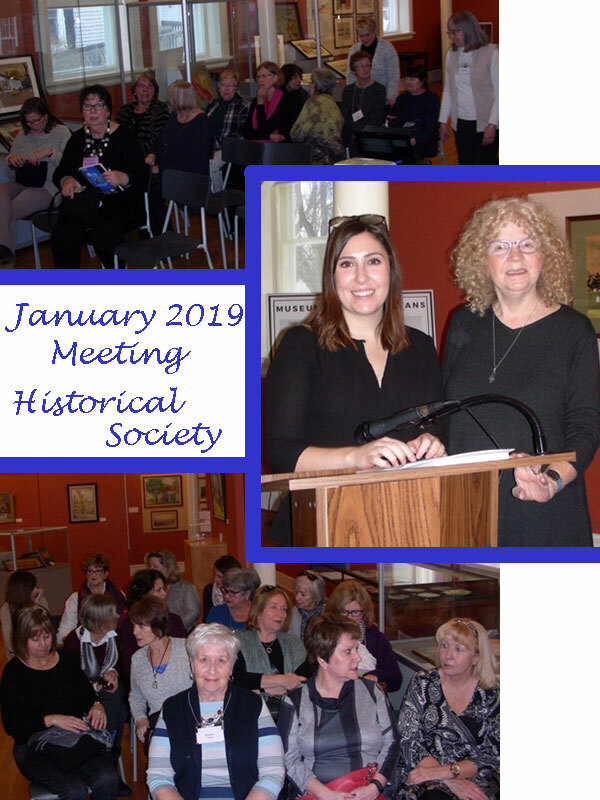 Stay tuned for our next monthly event at the Niagara-on-the-Lake Museum on Jan.16.19 at 1:30pm. See the EVENTS section to purchase tickets. 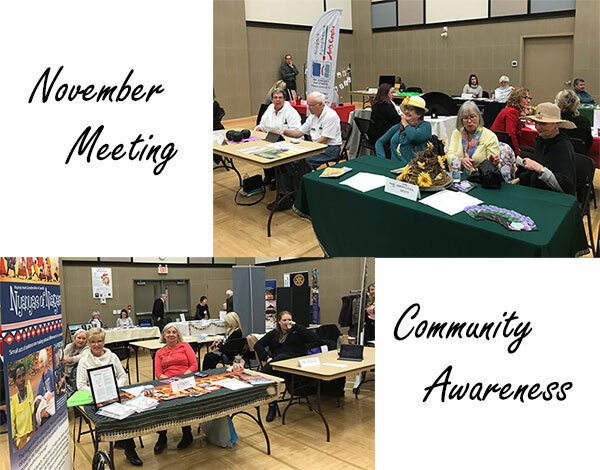 Our annual Community Awareness meeting was again a success for our members looking to get involved our lovely Community. 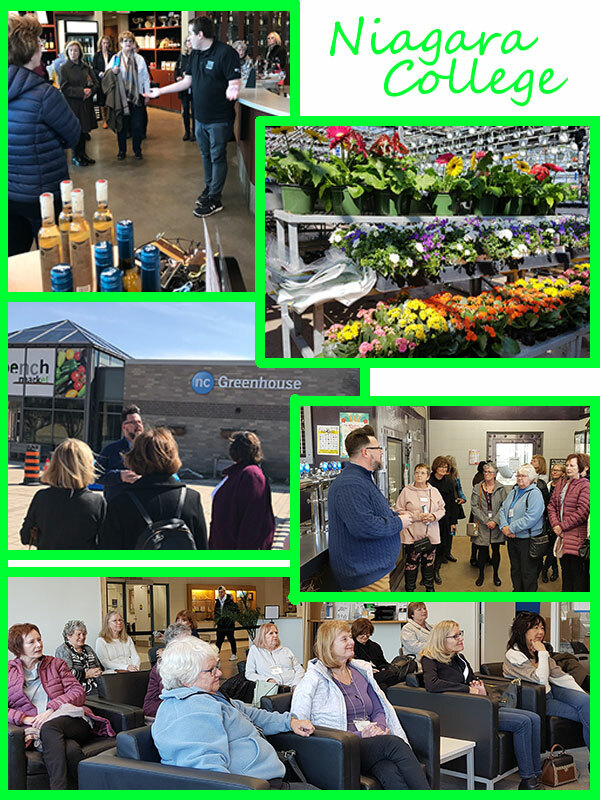 Twenty two groups were represented who were happy to chat with members old and new to NOTL who might be interested in joining in. Our Newcomers could consider Dinner and Dancing, Lawn Bowling, Running, Donating, Gardening, and of course, Volunteering and Donating. Presentations were made by Newark Neighbours and CARP. Newark Neighbours Thrift Shop and Food Bank supports over 200 residents with their groceries as well as providing student bursaries for 6 local students to further their education. CARP is the Canada’s largest advocacy association for older Canadians with more than 300,000 members. Its mission is to advocate for better healthcare, financial security, and freedom from ageism. 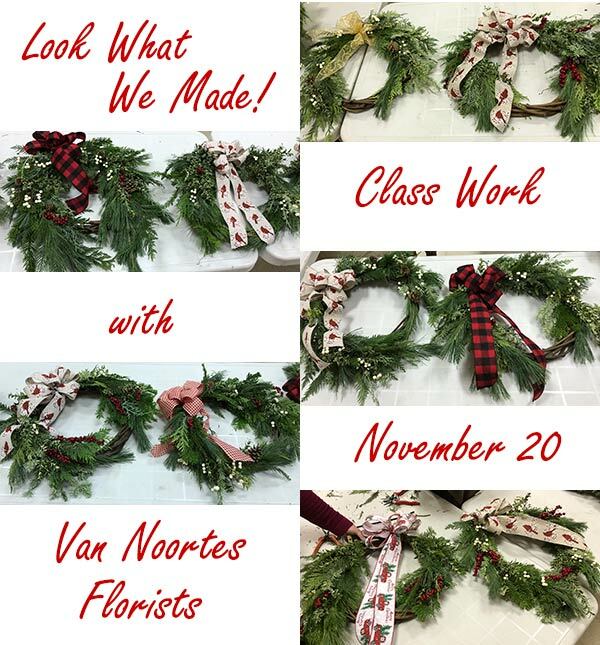 Arranged as a Special Event, 10 members made beautiful Christmas wreaths with fresh greenery on November 20. The Addison Hall (at St Mark's Church) smelled wonderful with all the lovely pine and cedar boughs we were using! We all have a new appreciation of Florists for the way they wrangle that greenery into a beautiful wreath. The students were all happy and proud at the end of the afternoon with our handiwork. 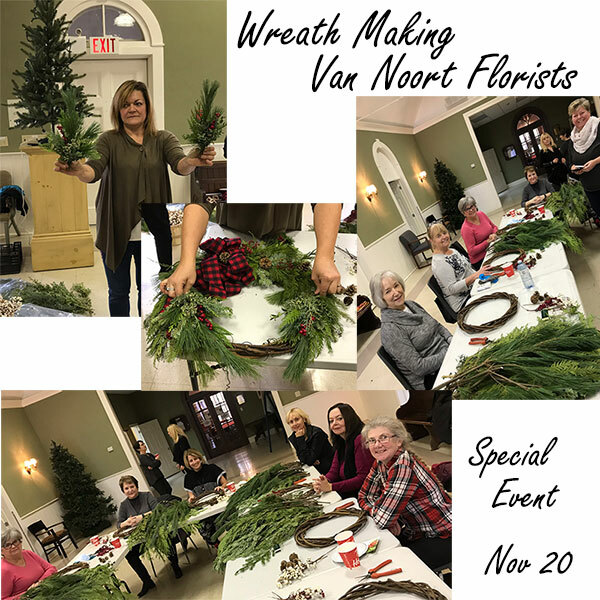 Thanks to the team from Van Noorts for sharing their skills and knowledge. Our keynote speaker was Peggy Hooke, Past President of Niagara-on-the-Lake Newcomers Club & retired High School Civics Teacher and Head of History & Geography with TDSB (Toronto District School Board). Peggy stressed the importance of voting and explained that Niagara-on-the-Lake is actually made up of only one Ward. We were encouraged to study the issues and select candidates that we felt represented our concerns. With 5 voting stations as well as 4 advance polls, and hours til 8 pm-voting is hopefully convenient for everyone. Fran Boot shared her quest to get everyone to spell Niagara-on-the-Lake correctly. Over the years the name evolved from N.o.t.L to NOTL (pronounced Nottle, like Bottle) and then many fell into the trap of using an ‘O’ and ‘T’ on the preposition and article respectively. We were all encouraged to use the acronym of NOTL or the correct use of lowercase for ‘-on-the-‘ as we write and type our new address. 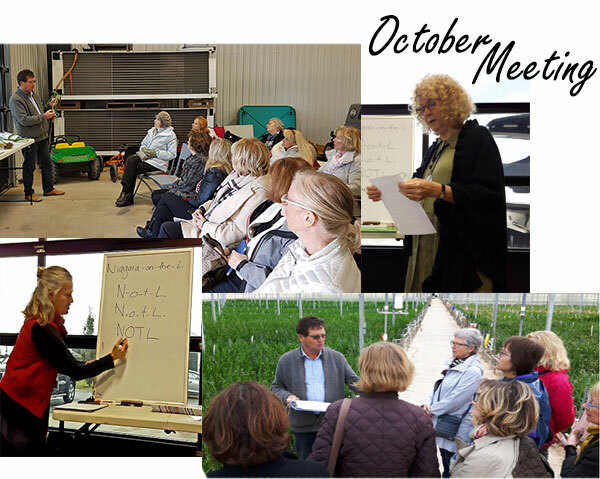 The highlight of our afternoon was a presentation by Pim Boekestyn of Virgil Greenhouses on Hunter Road in Virgil. (please note, they are wholesalers only and NOT open to the public) We learned how Freesias and Ranunculus are grown through a tour of their remarkably modern and efficient greenhouse. Mr. Boekestyn showed us the bulbs and developing plants and gave us a tour of the facility. It was a horticultural learning opportunity as well as a glimpse of what it takes to run and grow a business. We saw a fine example of a local successful entrepreneurial family. Our event ran in 2 smalls groups of 15 and an interim coffee social time was enjoyed by all. Stay tuned for more Newcomers Events, a great opportunity to learn AND meet other women from your new community. You will find us the last Friday of the month, at 9:30 - at the Community Centre (NOTL) in the Simpson Room! A chance to reconnect and catch up after the busy summer. Plus you can buy your tickets for several coming events. Stop by! 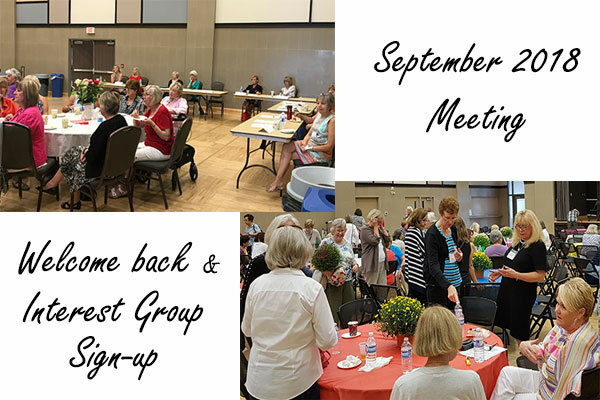 Our Newcomers Monthly meeting on September 19 at the NOTL Community Centre started the season off with 200 enthusiastic women, which included 10 brand new members! Everyone was invited to sign up for their choice of Interest Groups (25 to choose from); you can still do so by visiting our website for more information. 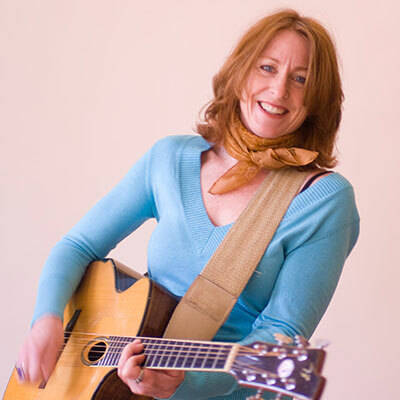 The lovely and talented guitarist Katherine Wheatly entertained us for a short interlude after which we could continue to chat and make new acquaintances. Hopefully you can see her perform again sometime when she plays at a local restaurant. Thank you to Erinn and Jamie of Sweets and Swirls Cafe for providing us with some lovely treats.